HÀ NỘI — Shares sank on both local markets on Tuesday as stocks were hit by investor selling, taking profits following a recent market rally. The benchmark VN Index on the HCM Stock Exchange dropped 1.08 per cent to close at 738.21 points, recording the worst daily decline since the beginning of the year. The benchmark index reversed a two-day increase of 0.6 per cent. The HNX Index on the Hà Nội Stock Exchange edged down 0.60 per cent to end at 93.24 points, posting the first loss after a four-day rally of 2.1 per cent. More than 335 million shares were traded on the two local bourses, worth VNĐ6 trillion (US$266.6 million). The figures were higher than Monday’s numbers. Strong investor selling put large-cap stocks under pressure and sent most of them down on Tuesday. The VN30 Index, which tracks the performance of the 30 largest companies by market capitalisation, lost 1.5 per cent with 27 stocks in the index declining by between 4.1 per cent and 0.3 per cent. Losers ranged from large-cap companies such as Vietcombank (VCB), property developer Vingroup (VIC), PetroVietnam Gas (GAS) to Kinh Bắc City Development Holding (KBC) and Thành Thành Công Tây Ninh Sugar JSC (SBT). According to market data provided by vietstock.vn, 18 out of 20 industries in the market were down with banking-financial stocks performing the worst. Among those industries, the brokerage sector index slumped 3.1 per cent, the banking sector index fell 1.5 per cent and the insurance sector index lost 2 per cent. 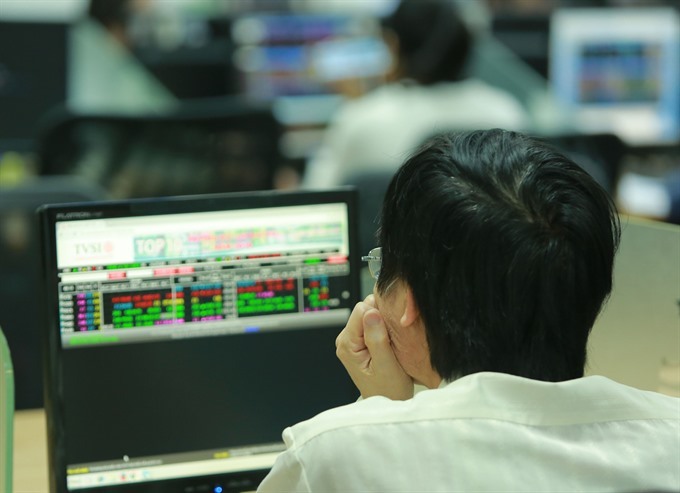 The brokerage sector recorded the hardest fall, as most brokerage shares had previously surpassed their old peaks such as HCM City Securities (HCM) and Sài Gòn Securities (SSI). Investor sentiment was also pulled down by sliding oil prices. Brent crude decreased by 0.9 per cent to trade at $51.81 a barrel, pushing the energy sector index in Viet Nam’s stock market down 2 per cent. According to Sài Gòn-Hà Nội Securities (SHS), Tuesday’s fall erased all gains the VN Index made in the previous trading week, but it was a necessary decline to help ease investors’ worries about margin lending and create a firm foundation for the stock market to rise further.